We (myself, wife and 13 yr old son) sailed on Independence of the Seas: 1/25/2019. This was a 6-night sailing that stopped in Nassau, Labadee and Falmouth. This was our forth cruise with RCCL and 7th overall since 2014. We had a very nice time and even some poor weather did not affect us that much. There was just so much to do on ship that we did not get around to everything. Embarkation was smooth. We arrived at the port about 10:15 and were on the ship by 11:30. Our cabin was ready at 1:00 and our luggage was delivered around 5:00. We did attend most, but not all of the shows. The ABBA (ABBACADABRA) show was nice and the production of Grease had us toe tapping and singing along. We’re in our early 50s and grew up to much of that music. Kudos to the production teams of both of those shows. Also attended a comedy show (Rondell Sheridan) who was very funny in both in the ‘family’ show and the ‘Adults Only’ show. The ice show was very entertaining as well and very similar to what we experienced on the ‘Freedom of the Seas’ back in 2016. My son and I tried the ‘SkyPad’ on the first day and we were both a little underwhelmed. We were going to try and get back to it again later in the cruise but never did. My son did play laser tag and said it was fun but was in a very confined area. I wanted to try so many more of the activities on board but just didn&apos;t get around to it. Did not try the flo-rider, rock wall or the &apos;Perfect Storm&apos; water slides but did play a few rounds of mini golf and enjoyed that. My son tried the other activities and had a great time. The food was generally very good and we had dinner in the main dining room every night. On sea days, we also had lunch in the main dining room and would highly recommend doing this if time permits. Not that the food is that much better but finding a table is simple and you also get waited on like during dinner. Sorrentos was a hit when we sailed on Freedom of the Seas a few years ago and this was no different. We enjoyed ‘Grabbing a Slice’ many times throughout the cruise. Our main dining room wait staff were very friendly, helpful and were very attentive to my wife’s celiac disease. They would have gluten free bread at her place setting every night while my son and I ate regular bread. They also presented her with the following night’s menu each night so she could select just about anything which they would then prepare gluten free for her the following evening. I think this would be easier to do if you had fixed time dining like we had but may be a bit more difficult for those choosing ‘My Time’ dining. Windjammer was very good as well with lots of options and a tip of the hat to ‘Mr. Washy – Washy’. Very entertaining way to get passengers to wash their hands before eating. Yes, seating was a bit difficult at times but we were always able to find a table in a short period of time. After a couple of days, one of the crew showed us that we could sit in Giovanni’s table restaurant during breakfast and that became our ‘go to’ place to eat when eating in Windjammer. Not sure how that would work during lunch or dinner but It’s directly to the left when you enter the Windjammer café and was awesome. We used the fitness center on 3 mornings and found it to be very nice. They had anything and everything you would find at your local club such as Planet Fitness. Equipment was in excellent condition with lots of it. Treadmills were very nice and you could look out over the ocean when you ran. PORTS: Nassau, Bahamas: We’ve been to Nassau a few times before so did not have any excursions planned and feel somewhat lucky that we didn’t. The weather was not good in Nassau and it rained off and on much of the day. We stayed on the ship and just ‘chilled’. I did talk top some people who did have excursions planned and said they generally had decent weather. Labadee, Haiti: We really like this port. My son and I did a parasailing excursion and had a great time. We also did a bit of snorkeling although this is not a great place to see many fish. My wife relaxed on the beach and read while we were parasailing and snorkeling. Lunch on Labadee was probably my least favorite meal and not that it was necessarily bad but it’s just not like other venues on the cruise. The burger and hot dog I had were fine but just overall a bit underwhelming. Falmouth, Jamaica: We have been here before and the last time, we spent the day at Margaritaville and had a fantastic time. This time we decided we’d wander out into the town (outside the gated port area). Once outside the gate, we were constantly approached by locals which made my wife a bit uncomfortable so we ended up going back inside the gated area and grabbed a few drinks at Margaritaville. The locals were fine if you told them that you were not interested but it was a bit much. I think if we would have gotten a little further away, it would have lessened but we decided to just go back. Debarkation: We chose self-debarkation since we had a scheduled flight for 11:55. This went very smoothly and we were at Fort Lauderdale airport around 9:45 only to find our flight had been delayed but that is no fault of RCCL. Overall, we had a great time. We did not notice the over crowdedness that some reviewers have written about although I understand our sailing was sold out. We were able to find sun beds when we wanted to but like any ship, finding one ‘poolside’ was difficult. We already have another cruise (Harmony of the Seas) scheduled and are very much looking forward to it late in the year. 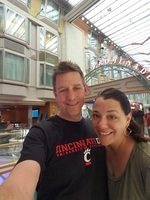 We (myself, wife and 13 yr old son) sailed on Independence of the Seas: 1/25/2019. This was a 6-night sailing that stopped in Nassau, Labadee and Falmouth. This was our forth cruise with RCCL and 7th overall since 2014. We had a very nice time and even some poor weather did not affect us that much. There was just so much to do on ship that we did not get around to everything. Embarkation was smooth. We arrived at the port about 10:15 and were on the ship by 11:30. Our cabin was ready at 1:00 and our luggage was delivered around 5:00. We did attend most, but not all of the shows. The ABBA (ABBACADABRA) show was nice and the production of Grease had us toe tapping and singing along. We’re in our early 50s and grew up to much of that music. Kudos to the production teams of both of those shows. Also attended a comedy show (Rondell Sheridan) who was very funny in both in the ‘family’ show and the ‘Adults Only’ show. The ice show was very entertaining as well and very similar to what we experienced on the ‘Freedom of the Seas’ back in 2016. My son and I tried the ‘SkyPad’ on the first day and we were both a little underwhelmed. We were going to try and get back to it again later in the cruise but never did. My son did play laser tag and said it was fun but was in a very confined area. I wanted to try so many more of the activities on board but just didn&apos;t get around to it. Did not try the flo-rider, rock wall or the &apos;Perfect Storm&apos; water slides but did play a few rounds of mini golf and enjoyed that. My son tried the other activities and had a great time. The food was generally very good and we had dinner in the main dining room every night. On sea days, we also had lunch in the main dining room and would highly recommend doing this if time permits. Not that the food is that much better but finding a table is simple and you also get waited on like during dinner. Sorrentos was a hit when we sailed on Freedom of the Seas a few years ago and this was no different. We enjoyed ‘Grabbing a Slice’ many times throughout the cruise. Our main dining room wait staff were very friendly, helpful and were very attentive to my wife’s celiac disease. They would have gluten free bread at her place setting every night while my son and I ate regular bread. They also presented her with the following night’s menu each night so she could select just about anything which they would then prepare gluten free for her the following evening. I think this would be easier to do if you had fixed time dining like we had but may be a bit more difficult for those choosing ‘My Time’ dining. Windjammer was very good as well with lots of options and a tip of the hat to ‘Mr. Washy – Washy’. Very entertaining way to get passengers to wash their hands before eating. Yes, seating was a bit difficult at times but we were always able to find a table in a short period of time. After a couple of days, one of the crew showed us that we could sit in Giovanni’s table restaurant during breakfast and that became our ‘go to’ place to eat when eating in Windjammer. Not sure how that would work during lunch or dinner but It’s directly to the left when you enter the Windjammer café and was awesome. We used the fitness center on 3 mornings and found it to be very nice. They had anything and everything you would find at your local club such as Planet Fitness. Equipment was in excellent condition with lots of it. Treadmills were very nice and you could look out over the ocean when you ran. We’ve been to Nassau a few times before so did not have any excursions planned and feel somewhat lucky that we didn’t. The weather was not good in Nassau and it rained off and on much of the day. We stayed on the ship and just ‘chilled’. I did talk top some people who did have excursions planned and said they generally had decent weather. We really like this port. My son and I did a parasailing excursion and had a great time. We also did a bit of snorkeling although this is not a great place to see many fish. My wife relaxed on the beach and read while we were parasailing and snorkeling. Lunch on Labadee was probably my least favorite meal and not that it was necessarily bad but it’s just not like other venues on the cruise. The burger and hot dog I had were fine but just overall a bit underwhelming. We have been here before and the last time, we spent the day at Margaritaville and had a fantastic time. This time we decided we’d wander out into the town (outside the gated port area). Once outside the gate, we were constantly approached by locals which made my wife a bit uncomfortable so we ended up going back inside the gated area and grabbed a few drinks at Margaritaville. The locals were fine if you told them that you were not interested but it was a bit much. I think if we would have gotten a little further away, it would have lessened but we decided to just go back. Debarkation: We chose self-debarkation since we had a scheduled flight for 11:55. This went very smoothly and we were at Fort Lauderdale airport around 9:45 only to find our flight had been delayed but that is no fault of RCCL. Overall, we had a great time. We did not notice the over crowdedness that some reviewers have written about although I understand our sailing was sold out. We were able to find sun beds when we wanted to but like any ship, finding one ‘poolside’ was difficult. We already have another cruise (Harmony of the Seas) scheduled and are very much looking forward to it late in the year. We had stateroom 8500, which is an Ultra Spacious Ocean View cabin at the very front of the ship. This was an amazing cabin for the three of us and could easily handle 4 to 5 passengers comfortably. It had two separate bedrooms with four large port-holes facing the front of the ship overlooking the helipad. One room had a king size bed with desk, closet and it’s own TV . The other room had a bunk bed with a nice long table where my son actually did much of his school work during downtimes. In between the two bedrooms is a ‘living room’ space with a large couch (Sleeper) and a couple nice chairs with foot stools plus a refrigerator. There was also a TV in this room which made it very nice when someone would get up early or be up later than the others in the cabin. You could go to the ‘living room’ area to read or watch tv and not bother others still sleeping. The bathroom was manageable although a bit on the small side but no real complaints. Highly recommend this excursion. took about 1 hour which gave time to enjoy the rest of the day on the beach. We had a great time doing this.